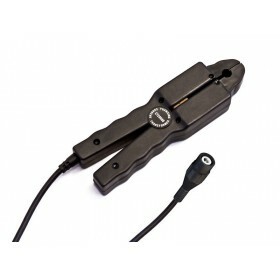 Oscilloscope Probe, 60 MHz, 1:1/10:1 An Oscilloscope Probe in excellent quality and modern design. A complete set of accessories is enclosed. Suitable for any oscillosope in the trade. 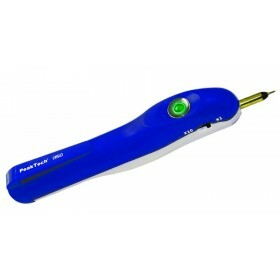 Oscilloscope Probe, 100 MHz, 1:1/10:1 An Oscilloscope Probe in excellent quality and modern design. A complete set of accessories is enclosed. Suitable for any oscillosope in the trade. Logic Probe, 20 MHz The Logic Probe is ideal for troubleshooting and analysis of logic circuits. 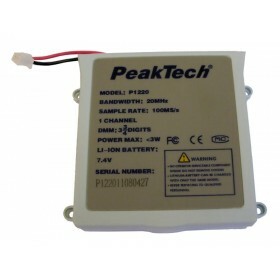 It works as a level detector, a pulse detector, a pulse stretcher and a pulse memory. 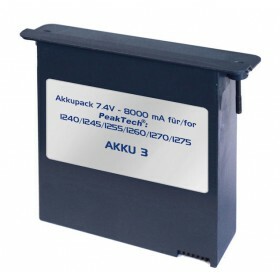 It can be used directly to inject a signal into the logic circuits without removing the IC or breaking the circuits. 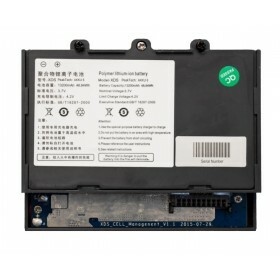 The 100 mA pulse output insures that the device under test will be pulsed, while the short 10 μs duration of the output pulse makes sure that no damage will be done to the circuit under test. The Logic Pulser output is switchable between 0.5 and 400 Hz, making it suitable for use with either a logic probe or with an oscilloscope. 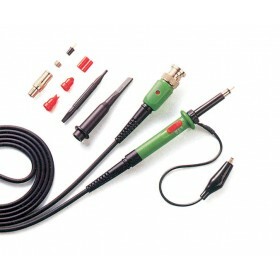 Oscilloscope Probe, 250 MHz, 1:1/10:1 An Oscilloscope Probe in excellent quality and modern design. A complete set of accessories is enclosed. Suitable for any oscillosope in the trade. 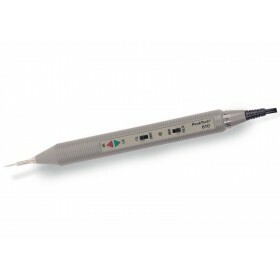 Oscilloscope Probe, 250 MHz, 100:1 An Oscilloscope Probe in excellent quality and modern design. A complete set of accessories is enclosed. Suitable for any oscillosope in the trade. 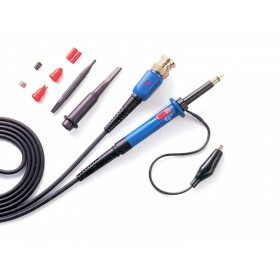 Current Clamp Adapter AC, 5A 8mm, with BNC Plug Professional measuring transducer that allows accurate measurements of low currents up to 5A AC in conjunction with a measuring device with BNC connection. 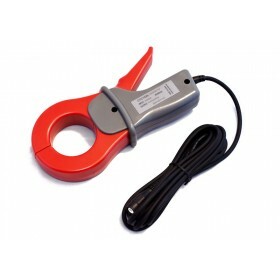 The extended shape of the measuring tongs and large cable length allow measurements even in narrow spaces. This current clamp adapter is ideally suited as an accessory for power meters, power analyzers and oscilloscopes. 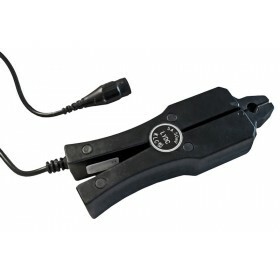 Current Clamp Adapter AC, 50A 8mm, with BNC Plug Professional measuring transducer that allows accurate measurements of low currents up to 50A AC in conjunction with a measuring device with BNC connection. The extended shape of the measuring tongs and large cable length allow measurements even in narrow spaces. This current clamp adapter is ideally suited as an accessory for power meters, power analyzers and oscilloscopes. 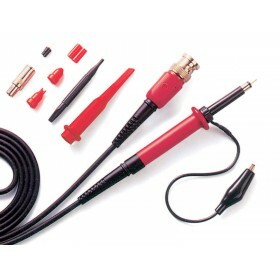 Current Clamp Adapter AC, 100A 13mm, with BNC Plug Professional measuring transducer that allows accurate measurements of currents up to 100A AC in conjunction with a measuring device with BNC connection. The extended shape of the measuring tongs and large cable length allow measurements even in narrow spaces. This current clamp adapter is ideally suited as an accessory for power meters, power analyzers and oscilloscopes. 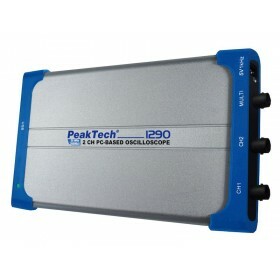 Pen-Type Oscillscope, 25 MHz, 100 MSa/s, PC based This newly developed Pen-type PC oscilloscope with a bandwidth of up to 25 MHz and a sampling rate of 100 MSa/s ideally suited for mobile use on the laptop. The applications are nearly limitless. 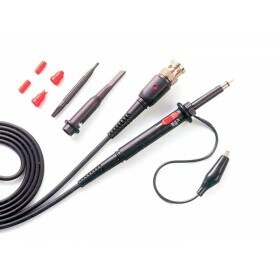 Wherever a small, lightweight, powerful and easy-to-use oscilloscope is required, this device is the right choice. The integrated USB interface allows the user to control the input signals with the included PC software directly on your PC. For example, the horizontal resp. vertical settings can be directly set on the device by using the build-in trackball. With its powerful software and its many features there are arise countless possibilities of applications in the service, development or industrial area. Current Clamp Adapter AC, 1000A 52mm, with BNC Plug Professional measuring transducer that allows accurate measurements of high currents up to 1000A AC in conjunction with a measuring device with BNC connection. The large opening of the round measuring tongs with handle for one-hand operation and the high cable length allow measurements even at large conductor diameters at more distant measuring locations. This current clamp adapter is ideally suited as an accessory for power meters, power analyzers and oscilloscopes. Digital Oscilloscope, 2 Channels, 25 MHz, 100 MS/s total, PC based This newly developed 2-channel PC-based oscilloscope is perfect for mobile use with a laptop, for permanent installation in control cabinets, for industrial facilities and many other applications where a small, lightweight and powerful oscilloscope is required. The input signals can be directly transferred to the PC via USB or LAN network. By the powerful software and the many functions provided, multifarious applications in service, science and industrial areas are possible. 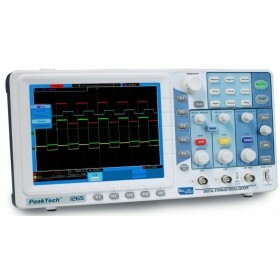 Digital Oscilloscope, 2 Channels, 60 MHz, 500 MS/s total, PC based This newly developed 2-channel PC-based oscilloscope is perfect for mobile use with a laptop, for permanent installation in control cabinets, for industrial facilities and many other applications where a small, lightweight and powerful oscilloscope is required. The input signals can be directly transferred to the PC via USB or LAN network. By the powerful software and the many functions provided, multifarious applications in service, science and industrial areas are possible. 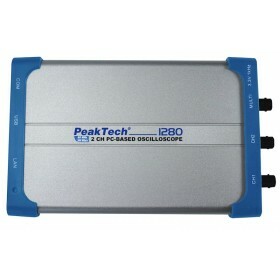 Digital Oscilloscope, 2 Channels, 100 MHz, 1 GS/s total, PC based This newly developed 2-channel PC-based oscilloscope is perfect for mobile use with a laptop, for permanent installation in control cabinets, for industrial facilities and many other applications where a small, lightweight and powerful oscilloscope is required. The input signals can be directly transferred to the PC via USB or LAN network. By the powerful software and the many functions provided, multifarious applications in service, science and industrial areas are possible.